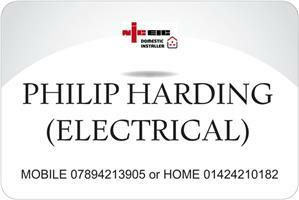 Philip Harding Electrical - Electrician based in Bexhill-on-Sea, East Sussex. I have been in the electrical industry for over 30 years. Constantly upgrading my City and Guilds qualifications and keeping up to date with new technology to insure, you as the customer receive the most efficient service, this includes being registered with the office for low emission vehicles should you need an electric vehicle charger fitting and want to claim your government grant. I'm a sole trader and have been for the past 17 years covering all aspects of the industry from domestic, commercial and industrial. Single sockets to full rewires and fault finding in the domestic sector, shop fitting in the commercial sector and much more. Fire alarms both domestic and commercial, security lighting, portable appliance testing, electric heating, test and inspection (EICR), landlord certificates etc. Professional, punctual and committed to quality, customer care and satisfaction. Call today for advise and free no obligation quote.